My love for bread doesn’t come from strangers… My mum is really good at baking, and this is one of my all-time favourites. 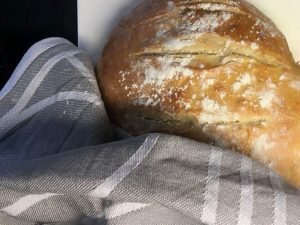 It doesn’t take long to make, but you do need to let the dough rest overnight – a perfect opportunity to eat fresh and warm bread for breakfast. The main ingredient is the semolina flour – integrating a little piece of Italy. Put the yeast in the water and stir. Add salt, oil and egg. Mix the normal flour and semolina flour together and add it to the liquid little by little. Knead the dough until it is smooth. Put it in the fridge overnight. The next morning, knead the dough with a bit of flour. 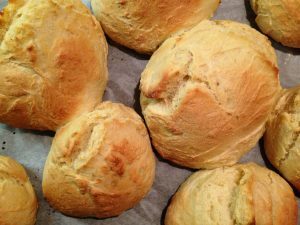 Shape the dough into a bread or bread rolls and leave it/them to rest for another 30 minutes. Glase with an egg and sprinkle with some flour. Bake it for 20-25 minutes at 200 degrees Celsius. ps. Semolina can be hard to find – I have found it in Marks and Spencer, Sainsbury’s online shopping and Waitrose. Sometimes it goes under the name ‘pasta flour’ or durum flour.